The plot surrounds a girl named Louise who has severe acne and is relentlessly bullied. She makes a life-changing wish, but in a twist of fate, her acne appears on her bedroom wall. Desperately, she tries to clean up this mess as her older sister Jennifer comes home. After seeing all the bowls piled in the kitchen, Jennifer grabs one and in a moment too late, she realises it’s not custard. IT’S NOT CUSTARD has an incredible team with a strong female crew leading theirheads of department in Producing, Directing, Writing, Cinematography, SFX Make-up and Set Design. They have also teamed up with Waldo Mason (Prosthetics – Prometheus, Harry Potter); Yann McCullough (Music Editor – The Hobbit, The Grand Budapest Hotel) and Nick Goldsmith (Producer – The Hitchhiker’s Guide to the Galaxy, Son of Rambow). IT’S NOT CUSTARD is the debut short film from British filmmaker Kate McCoid following an incredible year of working on some notable feature films: Doug Liman’s Edge of Tomorrow, Guy Ritchie’s Man from U.N.C.L.E, Thomas Vinterberg’s Far from the Madding Crowd and most recently, Joe Wright’s Pan. 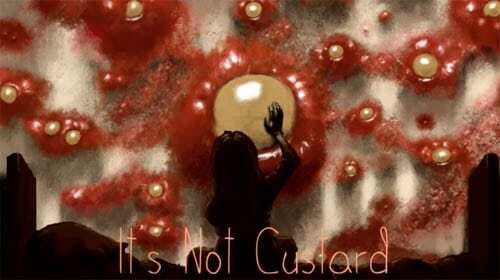 The idea for It’s Not Custard has been with Kate for years. She grew up in a bedroom with a textured wall and would often imagine what would happen if the walls came to life. This is also a film for the spot-popping enthusiast. A thriving culture that lies secretly just under the mainstream. The team have acquired half of their £10,000 goal on their IndieGoGo campaign with 9 days left to raise the rest of the funds. Pledgers can receive a variety of rewards including digital downloads of the script and movie, and even tickets to the VIP screening. The funds will be used to hire the equipment, to pay cast and crew, the VFX and special FX and the marketing of the movie. You can find out a big more about the film in the video below.